Premium Compatible Label Tapes for the Brother P-Touch QL500A printer. The Brother P-Touch QL-500A is a monochrome thermal label printer that is a perfect choice for home or office use. This label printer has a very fast printing speed and saves the precious time. This printer uses Brother P-Touch QL500A Label Tapes instead of ink or toner cartridges. The Brother P-Touch QL-500A is 1.09 kgs in weight and can print upto up to 212.6 inch/min - Roll (2.3 in) and offers a maximum resolution of 300 x 300 dpi. It has a zoom feature that lets one preview labels and layouts before printing. This printer has a printing speed of 50 labels per minute. This label printer produces clear and crisp quality of printouts but to some users the image quality may not be satisfactory. After printing, the Brother P-Touch QL-500A provides clean label cuts. This label printer is Mac and PC compatible. It is also compatible with a wide range of operating systems. The media types it supports are CD/DVD Labels, Continuous Forms, Die-Cut, Labels and Roll Paper. The Brother P-Touch QL-500A is a great choice for home or office users. The Brother P-Touch QL500A Label Tapes reduce the running costs by a great amount. As this label printer has a very fine printing speed, therefore it saves a lot of time and can be used for bulky operations. The quality of printouts is clear and crisp. Along with this it offers a zoom feature that enables easy preview labels and layouts before printing. But this printer has less connectivity options. Q. I created a label with barcode printed on it using my Brother P-touch QL500A. But the barcode reader is not able to scan the label. What went wrong? Magnify the barcode width to the maximum dimension possible. Because if the barcode is too small in size it becomes difficult for the barcode reader to scan. Avoid printing too many barcode labels together continuously as that may result in printhead getting heated up excessively. This results in poor print quality. Further this might stop the machine from printing further until the print head cools down. Avoid printing barcode labels with colours other than black. The barcodes should be created with black colour on white labels. Lastly, whenever you print the barcodes, go to printer driver, open the printer property settings and select the option “Give priority to print quality/High resolution”. Q. What accessories will be provided when I buy Brother P-touch QL500A printer? Is there anything exclusive? A. Every label maker or printer comes with the basic accessories necessary to start your printing work. The purchase of the new printer will include starter Brother P-touch QL500A label tapes, one being a die-cut standard address role and other being a DK continuous paper tape roll. Besides, a quick setup guide, cleaning sheet, CD ROM with software, printer driver installation and a user guide, AC power cord and USB cable will also be included. Q. When I purchased the Brother P-touch QL500A I received a cleaning sheet. Would you please tell me what exactly is the cleaning sheet given for? A. Sometimes it happens that dirt or lint from the roller settles on the print head causing it to jam. In such cases the user might face printing problems like bad print quality, lines, streaks etc. It is this time when you need to use a cleaning sheet to wipe away the dirt from the roller. The cleaning sheet comes with an adhesive surface and it can be used only once. Q. What are continuous labels? Do all Brother P-touch QL500A label tapes consist of continuous labels? A. Continuous labels are designed for heavy labelling work. For example, it allows you to print shipping labels continuously without any interruption. The cutter takes the responsibility to cut the labels so you have bulk labelling done in right time. No, all Brother P-touch QL500A labels tapes are not continuous tapes. You can look for the variety of label tapes listed above on the page. Q. 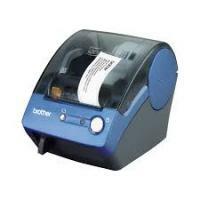 For my business I use 3 different Brother labelmakers including the Brother P-touch QL500A. So as my work demands, can I connect all 3 printers to one print server? A. Sorry. You cannot connect more than one printer to the print server. Nevertheless, you can definitely connect multiple printers to one network by installing PS-9000 print server for each printer. Q. Can you please state the applications of Brother P-touch QL500A label tapes? A. Sure. The Brother P-touch QL500A label tapes can be used for wide range of applications. You can use it on files and folders, envelopes, CD and DVDs, packaging, storage shelves, badging, barcodes, signage, shipping, retail, address and almost anything which can pair with labels. Q. Do you have an option to buy genuine Brother P-touch QL500A label tapes or only compatible ones are available? A. Our website offers premium quality compatible label tapes that work as excellently as the genuine ones.